Stephon Rose, 27, (left) and Finella Jarvis, 31, (right) hold up signs with Rikers Island statistics during a rally against the troubled prison yesterday. Photo by Sophie Herbut. When Finella Jarvis’s brother was arrested, he was sent to Rikers Island for months to await his trial before being transferred upstate. She panicked and worried about her brother’s safety. Jarvis knew Rikers Island to be a legal cage for human beings that devolves them into desperate animals. 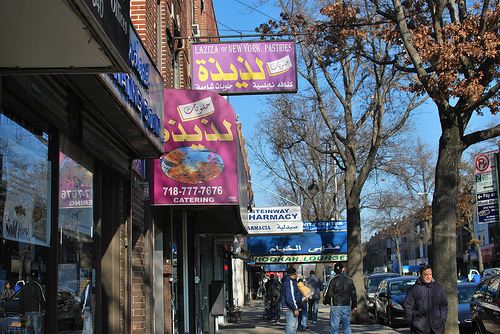 Jarvis and hundreds of protestors gathered on Steinway Street and 30th Avenue in Astoria, Queens yesterday to urge the closing of Rikers Island. The protesters marched to Hazen Street and 19th Avenue, the edge of the bridge to Rikers Island, chanting to free their sisters, brothers and friends. Rikers Island has been heavily criticized over claims and reports of extreme violence among inmates and correctional officers, corruption among the officers and contraband being snuck onto the island. Most recently an officer who pled guilty for covering up and helping beat an inmate to death. Jarvis’s brother was charged with a felony weapon charge. He was released this past December on appeal. Jarvis said Rikers Island is too far gone for anything to help. She said the best solution is to close it down. Jarvis’s brother graduated with a degree in Africana studies from Brooklyn College and is on his way to law school. But she knows there are not the same opportunities throughout every community. Jarvis said there needs to be more avenues for people to rehabilitate and learn from their mistakes instead of being branded a criminal and then having less opportunities than they did before. Walter Rodriguez, 45, from Claremont, Bronx, works in the Bronx Defenders, a public defense organization for residents in the Bronx. He said he sees clients wait years in Rikers Island for their trial in “deplorable” and “dehumanizing” conditions. Stephon Rose, 27, from Canarsie, Brooklyn said that these police tactics target minorities and low-income neighborhoods and once they have a criminal record, it’s almost impossible to come out of it. She said some of the laws are so obscure that not many people know about them. Rose said that detainees suffered emotional, mental and physical abuse as the cost of a small crimes. She said a resolution would be to provide education on these minor laws to make sure people don’t commit crimes they don’t know are against the law. 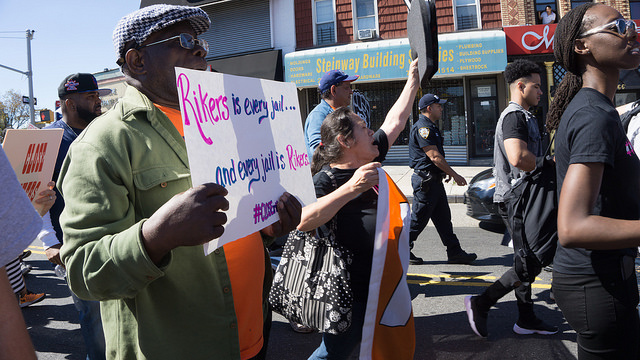 Protestors hold handmade signs draw attention to the faulty prison system at Rikers Island.. Hundreds of people of color marched yesterday to protest the condition at the jail. Rikers Island. Photo by Sophie Herbut. 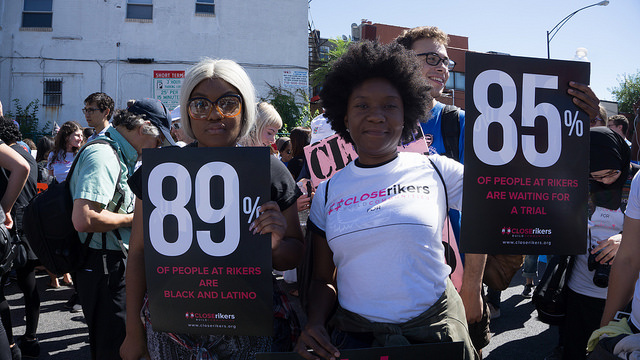 Protestors held signs with shocking statistics on the population of Rikers, as well as the amount of money, $209,000, being channeled into every inmate. Ironically, Rikers Island was named after Abraham Rycken, a slave owner. 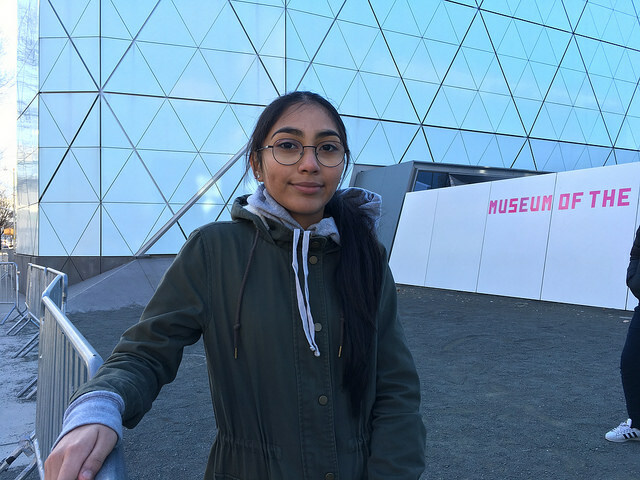 Pooja Kumbri, 23, from Harlem said that the best way to address people who have committed crimes is through compassion and understanding. As the rally approached its destination, police officers patrolled the barricade put up to prevent the protestors from crossing that point. “It’s ironic to see so many corrections officers protecting the island as if we want to go to Rikers Island,” City Council member Daniel Drom pointed out to the now halted crowd.